Chief Minister Smt. 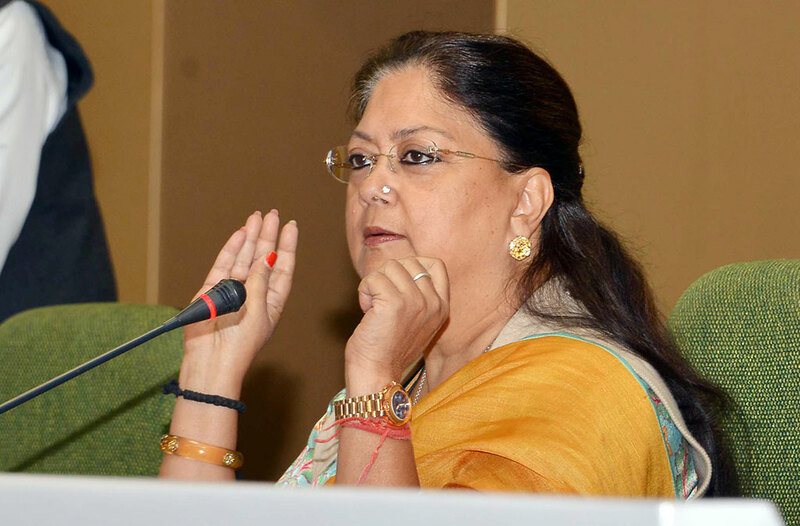 Vasundhara Raje has said that fast and effective redressal of public grievance would be possible by use of e-governance and Information Technology. Even service delivery could be improved using new IT-platforms. Also, with use of such applications community participation could be intensified in campaigns for sanitation, beautification, water conservation and plantation etc. On second day of the Collector-SP Conference on Friday, Smt. Raje was addressing the session dedicated to innovations and novel ideas of public grievance redressal. She appreciated use of a tourism mobile app called ‘LeZgo!’ being used in Ajmer-Pushkar circuit and another road-safety app ‘Humsafar’ used in Chittorgarh. She praised another web-application ‘Action Udaipur’ which was being promoted in Udaipur to connect people for positive things. The Chief Minister suggested the collectors to make use of IT-based innovation in their routine functioning. She said that such little ideas could bring smile on peoples’ face. Smt. Raje tasked the district collectors to reduce transmission losses in power distribution. She asked them to follow the Bithur Model of Ajmer district. She said that if a collector would act in mission mode in this matter, every district can save about 100 crore rupees. With the help from public representatives and support of the common people, power distribution losses could be reduced to below 15%. This would save about 3,300 crore rupees all across and the entire state would be benefited. She said that in Bithur village affiliated to Bhimpura Power Feeder, the villagers have exhibited their will power and brought down the losses from 47% to 21%. “As a result, the villagers are now getting power supply without a trip. We wish to scale-up this model to entire state,” she said. The CM said that if Mukhyamantri Vidyut Sudhar Abhiyan was executed on the lines of Mukhyamantri Jal Swavalamban Abhiyan (MJSA) the power supply scenario of Rajasthan would change entirely. All in-charge Ministers and Legislators should participate in the campaign by choosing at least one feeder each to bring down losses. She further directed for installation of LED lights to save power in urban areas. She said that every six months the district collectors would be ranked on the basis of reduction in power losses in their areas. Smt. Raje further hailed a project based on solar energy lamps in Dungarpur and other districts. She said that such projects be extended in the other tribal districts as well. With such projects use of solar energy would become high and the women self-help groups (SHG) would get earning opportunities. Dungarpur Collector Shri Surendra Kumar Solanki informed that about 40,000 families in the districts were benefited with this project and it gave employment to about 150 women associated with the SHGs. The Chief Minister asked the district collectors to line-up local donors to revamp government schools campuses. She said that this would create interest amongst the locals in education sector. She appreciated Project Ekta and Project Unnayan being implemented in Alwar district for improving infrastructural facilities and quality education in government schools. Such efforts empower the idea of education, she said. The CM directed the collectors to make special efforts in order to increase public awareness on use of polythene bags. She said that the people need to be informed that the poisonous substances get into the food through polythene and cause serious ailments like cancer. She said that used polythene bags thrown out were hazardous for cows. She said that use of polythene be stopped to ensure safety of cows. She also suggested to stop use of plastic and polythene for selling prasad at religious places. She appreciated the public awareness campaign initiated against use of polythene in Nagaur district. “As a result of this, Ladnun has been declared as polythene-free town and soon entire district would attain this status,” she said. Smt. Raje directed the officials to prepare an action plan for disposal of plastic waste. She suggested that polythene should be re-cycled for use in road-surfacing, making plastic oil etc. Such efforts would save environment and create employment opportunities, she added. She further appreciated the efforts of increasing income by way of plantation, kanya upavan, poly-house farming and aloe-vera production in Rajasmand district. She directed the officials for conducting farmers’ tours criss-crossing various districts to make them face-to-face with remarkable innovations in agriculture fields. Collector Shri Gaurav Goyal of district Ajmer, Shri Muktanand Agarwal of Alwar, Shri Lalit Kumar Gupta of Churu, Shri Surendra Kumar Solanki of Dungarpur, Dr. Jitendra Kumar Soni of Jhalawar, Shri Rajan Vishal of Nagaur, Smt. Archana Singh of Rajasmand and Shri Rohit Gupta of Udaipur gave presentations in this session.